Blog | March 2018 | Trimcraft’s Monthly Craft Summary for February, Plus Monthly Competition Winners! Trimcraft’s Monthly Craft Summary for February, Plus Monthly Competition Winners! Wow! It’s been another great month for crafting. Not only did we have lots of wonderful tutorials on the blog, we also had lots of amazing projects by you uploaded to our Inspiration area. Earlier this month Elle showed you how to create these delicious Fruit Pavlovas. Perfect for Mother’s Day, this desert is elegant and simple enough to create for a big dinner party (or for a treat!) Using seasonal fruit, these Pavlovas taste just as delicious as they look! We are huge fans of upcycling projects here – especially when they look as fab as these planters when complete! With the fun new First Edition Deco Mache papers, we transformed some used pop bottles into lovely planters to create our own mini garden! Why not create your own and fill them with your choice of greenery? Our Three Ways With feature looks at creative ways to craft – and this month we explored weaving! Maxine took you through three fun ways to incorporate this method in your crafting to create some fun makes that will look great in your home. What’s your favourite way to use weaving within your crafts? Of course throughout February we celebrated everything Valentine’s Day! We showed you how to create this wonderful Floating Heart Card using the Hearts and Crosses collection from Dovecraft. Not just for Valentine’s Day, you can adapt this design to suit any occasion. We also had a great video tutorial for you this month, showing you how to create a Hidden Surprise Card. Using the adorable Hey Baby papers from First Edition, the surprise element to this card adds and extra special touch to this DIY! What occasion would you use this card for? With Mother’s Day just around the corner, we showed you how to create this super fun rosette card using the wonderful First Edition Kale Washi Tapes. The rosette is detachable for you to give to your #1 Mum! Lots of you across our social media loved seeing Martina’s DIY handbag gift bag using the beautiful Nature’s Grace collection. This is the perfect craft to make your gift-giving extra special! Create this fun slider card to amaze your friends and family – simply pull the slider to watch the colours magically appear! This card can be used for any occasion and you can add your favourite sentiment to the inside panel of the card to be revealed as the slider is pulled. Kathy showed you how to create this stunning Iris Fold design using the V&A Papercraft collection. Using our free template, you can make your own for the perfect piece of home décor. 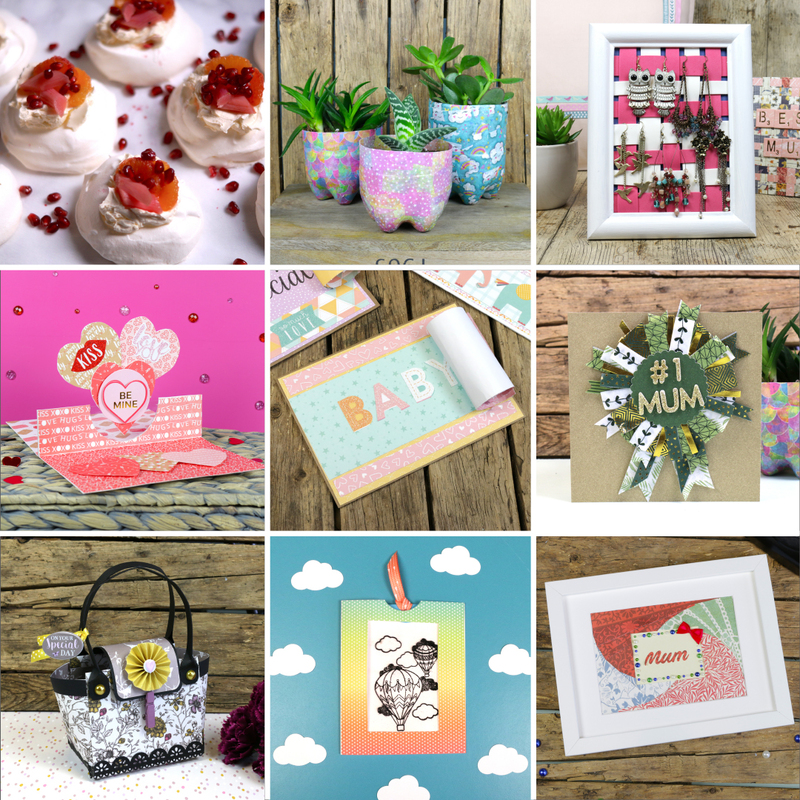 Which has been your favourite craft from the blog this month? Last month, we asked you to create anything Spring themed for our Craft Challenge! We had so many wonderful entries this month, however, this lovely project by paperistani really stood out for us. How cute is the little chick?! Congratulations! Choosing the Project of the Month is always a tough decision as we have so many amazing projects to choose from in the Inspiration area! However, the lucky winner is bizziebees who created this wonderful Fox quilt! Congratulations! Congratulations to reggie22 for winning this Perfect Allusion 12" x 12" paper pad! Happy crafting! What’s been your favourite craft of the month? Let us know in the comments box below! Biiiig congrats to all the lucky winners here this month, and thanks to you and your talented ladies for all the amazing inspiration all month too, there´s soooo much I really want to give a try or a try again, as some of it has been some real oldies but goodies, that we´ve all forgot about, that´s come out again, and that is so cool. Have an awesome International craftmonth here now everyone. Hope we´ll all be sooo inspired by each other here. Congrats to all the winners!!! I'm in love for all these stunning projects!!! Well done to all the winners. All great projects. I love the chick. congratulations to all the winners, the 2 projects are amazing.